We all get the same advice drilled into us as kids. Brush twice a day, floss every week and use mouthwash. These are the steps you take at home to make sure your teeth are clean and healthy and that your smile is bright and white. The problem is, most people don’t remember the most important piece of all: regular checkups. Regular dentist visits, twice a year, are the most important part of keeping your teeth and oral health in top shape. 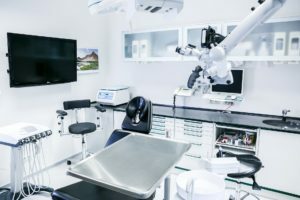 The professional experience of dentists, their specialized equipment and top notch staff combine to help catch or prevent serious and costly issues down the road. Think of how difficult it is to see the back of your teeth. You can take a picture with your phone or do some tricks in a flexible position near a mirror, but you still won’t be able to see nearly as much as a dentist can with a mouth mirror. At a dentist’s office, they have every diagnostic tool imaginable from simple metal tools to high-tech dental x-rays. These devices can help you see under the surface of your teeth, mouth and jaw which helps paint the full picture. While you can notice serious problems at home too, a normal person isn’t able to see small cavities or symptoms of more serious issues like oral cancer or gum disease at home on their own. At a bi-annual checkup, dentists use their experience and their equipment to keep your mouth safe, clean and healthy. Does Medicaid Cover Routine Dental Care? If you have Medicaid and think you can only go to the dentist if you’re having serious issues, think again. Medicaid covers visits for you and your family while providing you the peace of mind when it comes to their health. Also, remember that preventative dentistry like small fillings or minor fixes are much cheaper than serious procedures like root canals and crowns. Using the benefit of covered visits allows you and your dentist to tackle problems early and reinforce the healthy habits we discussed above. Starting as a child when your teeth come in, it is important to see the dentist twice a year. These visits are crucial to your oral health and development along with helping conquer other issues like fear of the dentist or doctor. At Beechcroft Dental, we welcome patients with Medicaid. We want to help keep you and family smiling proudly and happily with bright, white teeth and healthy gums. Contact us today at 1-614-776-4950 to make an appointment. If you’d like more information on our office or to find out more about your coverage and options, contact us today!